Click on the graph to see it more clearly. Each circle is a data point. 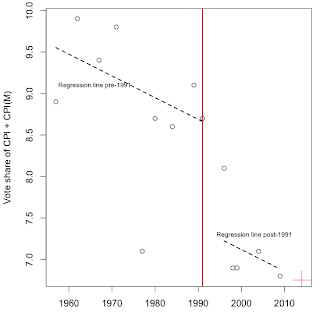 The dashed line is a (robust) regression of the Left voteshare on the time trend, with a shift in the intercept in 1991, reflecting the fall of communism. As we can see, the fall of communism seems to have gone along with a loss of vote share of 1.3 percentage points for the Left. The latest result is a bit worse than the trend line might have suggested: tactical factors went a bit against the Left. At the same time, the CPI and CPI(M) leadership can take heart: the latest result is not all that far from the historic decline of the left, so this does not suggest that the leadership made particularly large tactical errors. What they are perhaps up against is historical forces. The red coloured plus sign is the linear extrapolation for 2014; the slope implies losing roughly 0.13 percentage points of vote share each five years. (The statistical signifiance is weak; it's a t stat of -1.52). Could you share with me how to got the data on the election vote share. I cant find it online and the ECI website has it by constituency which would be too time consuming to add up. Have you noticed how the big gap came after the fall of communist bastion, USSR? guess china stopped supplying slush money to Indian communists to fight elections with!! But seriously, I am bothered by this. As someone who is UN-happy with "Indian style" of government there is no alternative to protest with! Let me explain: Today's Econ Times CROWED with pride in its traditional 2nd hand colonial style about how indya is ranked 4th (!) in world in purcasing US Treasurys over last 6 months. I mean WOW. (aside: this is why TOI/ET is abhorrent to me...classically bad indian tone to its writing). What is difference between India and other countries on this (proud?) list? 1) other countries have 24 hour electricity throughout the country. 2) other countries on this list have at least "2nd world" sidewalks, roads,public transport infrastructure, and sanitation in their major cities. (mind u not their villages...i'm referring to MAJOR cities). WHAT is the currency impact of spending $20bn to improve public transport instead of lending to US? My guess...negligible. Maybe ruppee would appreciate to 39-40 but we would get ac buses. sidewalks to walk on, and electric current when required. I feel thisis because of hindu religion: Karma theory states: what you benefit, y0u have earned from prior good deeds. what your brother suffers...its his/her problem...no need to fret! So, in country of 1 billion, we encourage driving in Skoda etc stuck in jams...because better than walking. Our women become confined and overweight due to barbaric infrastructure. Yet middle class NEVER ccomplains. and our papers crow with pride how we have lent $20 billion. WOW. But the LEFT deserves to die. they are traitorous and equally useless! Meanwhile our youths study 9 hours to top ICSE exams. WOW. Superpower. This is very interesting. Vote share is, of course, not the same as winning seats. E.g. if a party contests more seats, it will seem to get more vote share. Maybe when the CPI and CPI(M) were getting more money from the USSR and from China, they had the organisational capability to contest from more seats, so they got a bigger vote share. Maybe after the collapse of communism, this funding stream went down, so they contest fewer seats, so their vote share looks smaller. So there are two possible explanations for why there was a big drop in vote share when the USSR collapsed: Either some of their voters wised up and quit voting for the left, or they contested fewer seats. When you look at Surjit's data, the "contesting fewer seats" does seem to be happening to some extent. That leaves the slow ebbing away of vote share - as you say, of roughly 0.15 percentage points every five years. This must hurt. Vote share is not seats, and in the short run many tactical issues matter (e.g. Mamata + INC coming together to beat CPI(M)). But in the long run, nothing matters other than vote share. If the life keeps ebbing out of the left in this fashion, their future is bleak. The drubbing that the CPI and the CPI(M) got in this election, and the likely loss of West Bengal that the CPI(M) will suffer in the coming assembly elections, will have one more effect: Fewer young / ambitious / opportunistic / corrupt individuals will sign up to work in these parties. That will (in turn) generate a further loss of vote share. Remember that both parties have a top-heavy structure with critical ancient people keeping it all together. As that old leadership (e.g. Harkishan Surjeet / Jyoti Basu) dies away, the next bunch (e.g. Prakash Karat) has a lot less capability in holding a party together and in winning votes. The whole thing could come apart much worse than is suggested by the time trend regression in the coming 10 years. The two things to watch out for are: CPI(M) losing control of WB and the death of Jyoti Basu and Buddha.